Note that this is a re-titling and republication of the book The Acid. Toward the end of his fifties, Christopher Gray took, for the first time in years, a 100-microgram acid trip. So extraordinary, and to his surprise so enjoyable, were the effects that he began to take the same dose in the same way--quietly and on his own--once every two to three weeks. 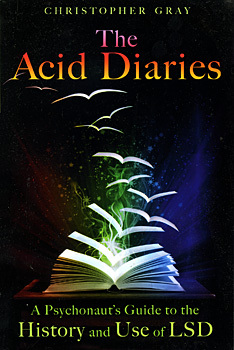 In The Acid Diaries, Gray details his experimentation with LSD over a period of three years and shares the startling realization that his visions were weaving an ongoing story from trip to trip, revealing an underlying reality of personal and spiritual truths. Following the theories of Stanislav Grof and offering quotes from others' experiences that parallel his own--including those of Aldous Huxley, Albert Hofmann, and Gordon Wasson--he shows that trips progress through three stages: the first dealing with personal issues and pre-birth consciousness; the second with ego-loss, often with supernatural overtones; and the third with sacred, spiritual, and even apocalyptic themes. Pairing his experiences with an exploration of psychedelic use throughout history, including the ergot-spawned mass hallucinations that were common through the Middle Ages and the early use of LSD for therapeutic purposes, Gray offers readers a greater understanding and appreciation for the potential value of LSD not merely for transpersonal growth but also for spiritual development. Christopher Gray (1942-2009) was well known for his involvement in the 1960s with Situationist International, for his various radical writings, and as Swami Prem Paritosh, disciple of the guru Osho. He translated Raoul Vaneigem's Banalités de Base (as The Totality for Kids) and is the author of Leaving the Twentieth Century, the first English language anthology of Situationist ideas, and the biography Life of Osho.